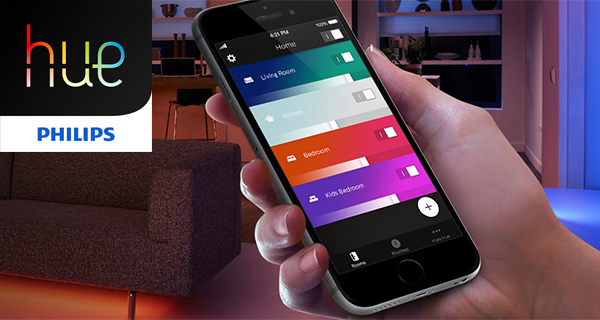 Philips may have caused a storm in achievable and affordable home automation when it introduced the excellent Hue range of connected bulbs and lighting solutions, but the same really couldn’t be said for the accompanying Philips Hue app for iOS and Android. It could probably be best described as “functional”, in that it did what it needed to do, but wasn’t particularly precious about looking slick or offering a fluid user-experience. Given the fact that the Hue range has not only taken off globally, but also expanded beyond the original offering, Philips clearly understands that things can only grow from here, and have celebrated that revelation with the release of the Philips Hue gen 2 app for iOS and Android that dramatically overhauls the whole experience. What becomes immediately noticeable when launching the new Hue app is that everything looks and feels bright and welcoming like a breath of fresh air has been injected into the experience. There’s a clear design direction to make everything instantly accessible, and to make navigation between sections as easy as possible with large visible buttons and clearly defined areas of interest. The likelihood is that it still won’t be to everyone’s taste – especially iOS users who don’t agree with the included Android-esque floating button – but it’s a dramatic improvement on the older app. The aesthetics is definitely one improvement, but it’s really how the interaction occurs with lights and how they are able to be grouped that really makes the most sense here. 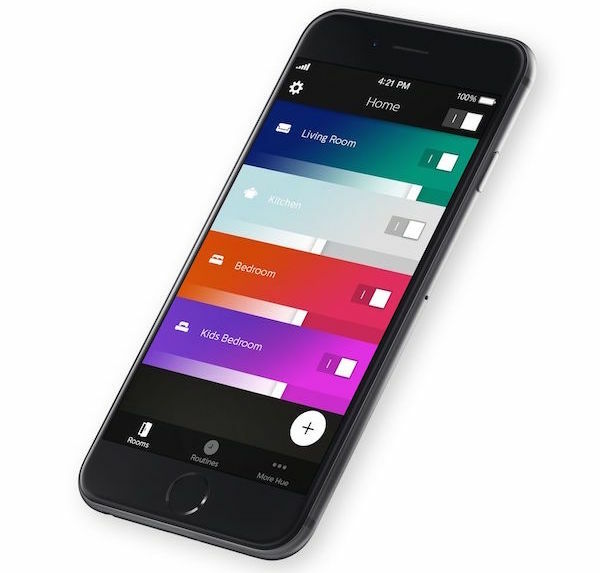 Rather than having to consider an all-or-nothing-approach, the new Hue app allows lights to be sectioned off into a room environment, therefore allowing them to be controlled via the app and Siri (with a compatible HomeKit Bridge 2.0) on a room-by-room basis rather than on a house level or individually. Additional features include the ability to set up new ‘Routines’ that allows users to set up light schedules to coincide with daily activities. Want your lights a certain color when waking up in the morning, but a more relaxing temperature in the evening and night time? 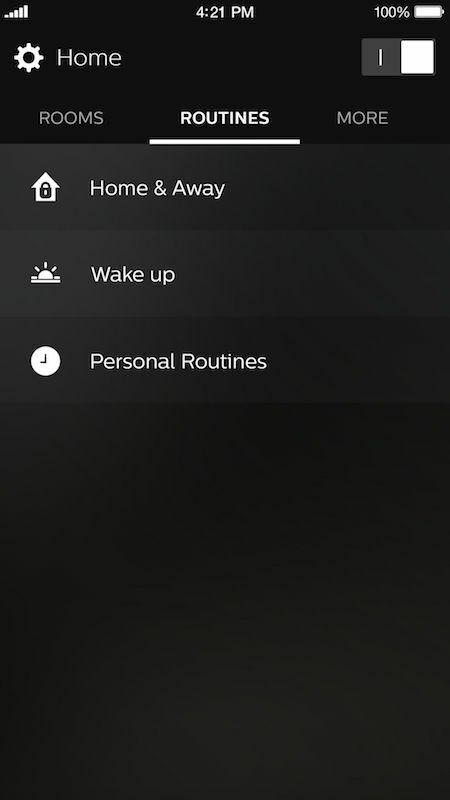 Then ‘Routines’ will automate all of that for you. There’s also a new route to creating scenes with alternating light colors thanks to the new functionality that analyses an uploaded image and picks out the dominant colors found within it. There is a catch to this latest app though; no Apple Watch support, for now at least. Philips says that users looking to use the app through their Watch best stick to the older Philips Hue gen 1 app which is still available to download separately. Both apps can be used simultaneously on the same device. Both the iOS and Android variants of the second-generation Hue app are live right now on their respective app stores.